Canon’s G series has converted many a serious film shutterbug to digital photography. Launched in 2000 with the PowerShot G1, the sturdy G line helped establish digital photography as something more than a novelty. But judging from the latest entry, the Canon PowerShot G9, the line may have outlived its usefulness. Make no mistake—this serious-looking black brick of a camera is capable of producing great images. But the G9 is out of sync with the marketplace, offering few compelling advantages, and some distinct disadvantages compared to cheaper point-and-shoots and comparably priced DSLRs. Improvements over the preceding G7 are minimal and not all advantageous. Canon deserves cheers for including RAW mode shooting, which retains more information than JPEG. But the new image sensor merely crams in two more megapixels that nobody needs, bringing the G9 to a gratuitous 12.1 megapixels. And the bigger 3-inch LCD screen is bright and detailed, but it also steals needed space from what was once a useful optical viewfinder. The G9 falls into to the so-called prosumer class of point-and-shoot cameras that include advanced attributes such as shutter- and aperture-priority modes and RAW capture. The G9’s image quality is certainly comparable or superior to anything in that class, scoring Very Good on both image and color quality in Macworld Lab tests. Photos came out with sharp detail, minimal noise, and pleasing color balance at low ISO settings. (Expect increasing noise and fuzz as you go above ISO 200.) Automatic exposure control was consistently reliable, while autofocus had an occasional tendency to wander. On the plus side, the odd little rotating ring on the G9’s main control button makes this one of the few point-and-shoots with a usable manual-focus option. The G9 falls short in other areas, however. Most recent models similar to this one are superzoom cameras that cover a range from wide-angle to extreme telephoto. 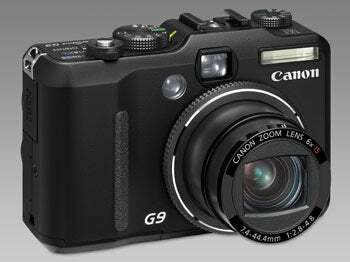 The G9’s lens starts out at a relatively modest 35mm and extends to 6x optical zoom, but a mere 4x digital zoom. Most new prosumer models also have bright, information-packed electronic viewfinders, giving photographers greater flexibility in how they compose images. Pushed by the expanded LCD screen, the G9’s optical viewfinder is so tiny that it’s all but useless, especially since it only covers 80 percent of the image and shows the edge of the camera lens when it’s not zoomed. Add in some odd design and control choices—ISO settings are elevated to a separate rotating knob on the top of the camera, but you’ll need to dig through the menu to alter a basic function like image stabilization—and it’s tough to make a case for the G9’s $500 price tag. You can spend $150 less and get an equally capable point-and-shoot, such as the Samsung NV11 ( ). Or, you could spend $50 more for a DSLR with all of the above plus a significantly broader aperture range and versatility, which will allow the camera to grow with your skills. The main market for this camera seems to be serious photographers who don’t want the clutter, expense, and weight of a DSLR. But with SLRs hitting price points of $500 and weighing less than a pound, those arguments don’t hold much water anymore. Instead, the G9 is likely to succeed mainly on looks—the styling invokes the classic rangefinder cameras of the pre-digital era—and brand loyalty. I made my jump into digital photography with the G2 and have had a soft spot for the G line ever since. But sentimentality is good for greeting cards, not expensive camera-buying decisions. Scale = Superior, Very Good, Good, Fair, and Poor. While it’s a worthy camera in most ways, the Canon PowerShot G9 doesn’t offer many compelling advantages over lower-priced competitors. It’s hard to recommend it as a reasonable value.